Since the mid ’70′s, natural healing has been a focus in my life. I discovered colon hydrotherapy when I was exploring detoxing methods. I was amazed at how much better I felt after my first series of colonics, emotional as well as physical. Lifelong constipation became a past issue. A few years ago, I was considering major surgery and realized that until my body was healthy again, surgery was not going to help me. I understood the key to improved health was to cleanse my body of toxins I had been exposed to. Once again, I was led to colon hydrotherapy. Through extensive study of several different philosophies, I am convinced that cleansing has to be empowering to the person as well as respectful of the nervous system for the body to cleanse effectively. 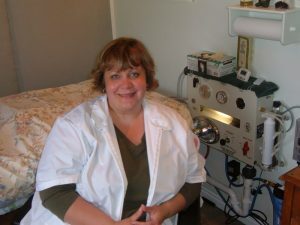 I then knew my calling…to help others as well as myself with colon hydrotherapy. I chose a school, teacher and method that fit the requirements I found essential including the most advanced instruments and procedures. I attended the International School of Colon Hydrotherapy and am Advanced Certified with I-ACT, International Association of Colon Therapist. With the best available procedures to offer, I love helping people and find this work one of the most rewarding things I have ever done. Call (801)918-0784 for more information and to set up a cleansing program.